Hi crafters! Today I am sharing a card featuring a new release from C.C. 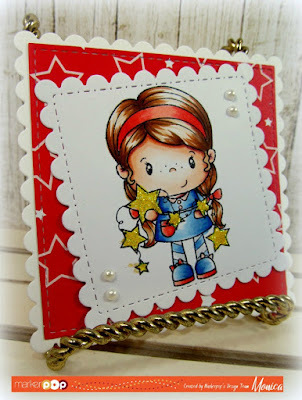 Designs "Little Pixie Star". She is stamped on on X-Press IT blending paper and for a nice strong adhesive I used Crafter Companion Double Sided Adhesive. I colored Miss Pixie with Copic pens: E000, E00, E11, R56 for her skin. Her outfit is in: R12, R14, R17, B21, B23, B24 and B29 with a touch of C1. If your looking for way to store all your stamps, I used some Stamp & Die Storage Pockets (Avery Elle) they work wonderfully. I hope everyone enjoyed my post and thanks so much for stopping by everyone!! Please don't forget to check our challenges and you could be the next MarkerPOP winner!